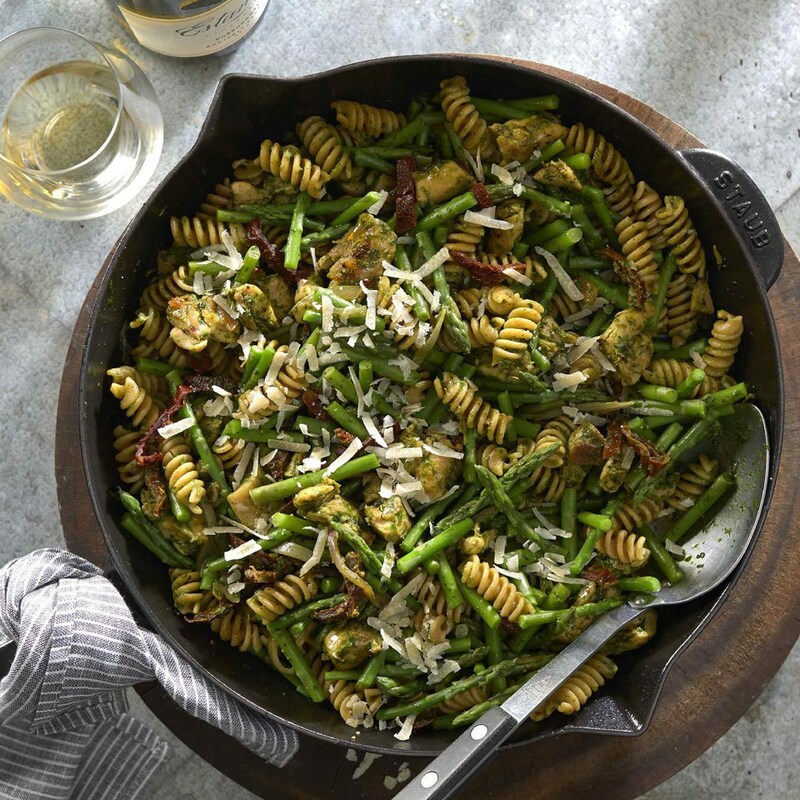 Fresh lemon juice, tangy sun-dried tomatoes and zippy pesto tie together the flavors in this quick and easy skillet meal. The 30-minute dinner is so versatile—you can use any quick-cooking protein or vegetable you have on hand and still have a delicious meal on busy weeknights. ring a large pot of water to a boil. Add pasta and cook for 3 minutes less than the package directions. Add asparagus and sun-dried tomatoes and continue cooking until just tender, 3 minutes more. Drain. Meanwhile, heat oil in a large skillet over medium-high heat. Add shallot and cook, stirring, for 1 minute. Add chicken, salt and pepper and continue cooking and stirring until the chicken is just cooked through, 5 to 7 minutes. Reduce heat to medium; stir in broth and pesto and cook until slightly reduced, about 2 minutes. Add the pasta and vegetables to the skillet and toss to coat. Cook, stirring, until heated through, 1 to 2 minutes more. Remove from heat and stir in lemon juice. Garnish with Parmesan, if desired.